"The material behaved exactly as I would have expected had it been blood […] I can think of no other material that would have behaved in that way - save for blood. […] I am certain in my opinion that the material there was blood. I concede that is not proof positive." Click here to see the full transcript of Hussain's trial testimony. Why was Mr Hussain asked to carry out this test when his forensic specialism is not 'blood evaluation' but 'Fingerprint detection and enhancement’? Why was this test required when a KM test, which is more specific than Hussain's test, was said to have already been done? The TAB test that he used was not the normal presumptive test for blood. 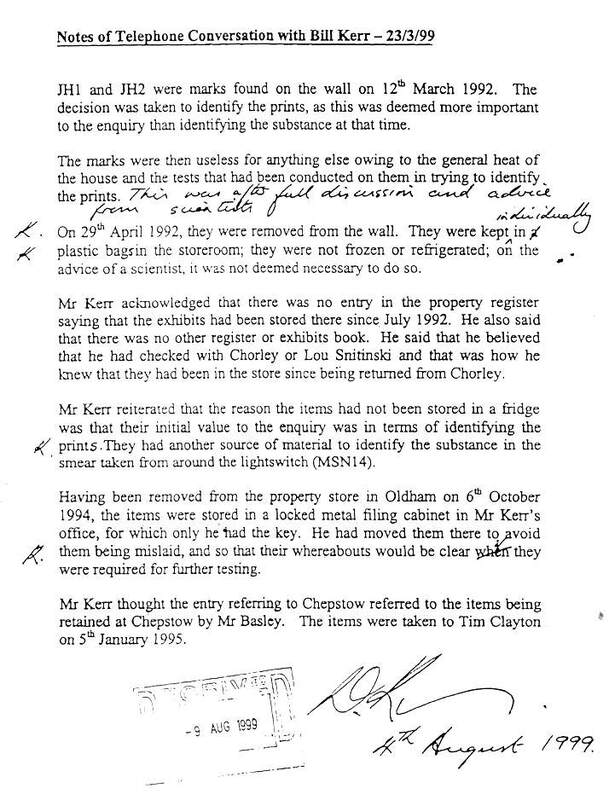 "After full discussion and advise from scientists the decision was taken to identify the prints, as this was deemed more important to the enquiry than identifying the substance at that time. The marks were then useless for anything else owing to the general heat of the house and the tests that had been carried out on them in trying to identify the prints." If this statement is true, why did he ask Hussian to carry out the blood test several days after the enhancement work? Why was this test, carried out on a substance that had been rendered 'useless' for further testing, relied on in court? Document attached. "There appears to be a lack of scientific proof as to the nature of the marks. The test used is a screening test and is only indicative of the presence of blood. It is not unknown for the test to give false positives. Hussain has produced no scientific paper that indicates Tetraaminobiphenyl (his test agent) will react with nothing other than blood and I asked him for the information. I cannot believe it will not give some false positives." Would the jury have come to the same verdict if they had heard this man's testimony? "I have studied the information you sent me regarding Susan May's trial. My overall impression was that, if this evidence was the mainstay of the prosecution's case, Susan was convicted on extremely flimsy grounds. 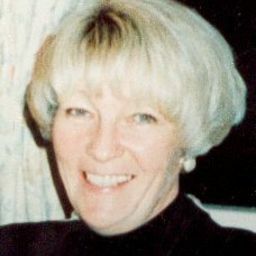 The main point of weakness in this evidence is that none of the police tests were able to demonstrate categorically that the substance in which Susan's fingerprints were made was blood, let alone Hilda's blood. The single test which would have proved the origin of the stain should have been carried out immediately and by experts. There does seem to be a case for negligence here." "both these findings could be due to the insitu fingerprint treatment they received. Similarly, it could be that the blood was 'old' thus explaining its lose of biological activity or (as in the case of JH1) that it was not blood at all." Susan's fingerprint was only ever identified in the stain JH1. "cannot be regarded as specific for blood and therefore it has not been established by this test that the marks were blood. I consider it misleading to say that "the material behaved exactly as I would expect had it been blood," because there would appear to be many materials that would behave in the same way. The scientifically justifiable conclusion is that blood is one of an unknown number of materials that would have tested positive and furthermore have a reasonable chance of being present in a house. The lack of appreciation of the possibility of false positive results was compounded by the scientist giving evidence to the court that he was 'certain' of the nature of the material as blood. This would have misled any reasonable person as to the weight of the evidence regarding the nature of the material." This is the weight of evidence that put Susan in prison. This evidence was rehearsed at the 2001 appeal and the judges chose to disregard it.